If you haven't already guessed.. I'm going to be talking about this little gem. My favourite item in my whole makeup collection. That's right, it's my MAKEUP FOREVER LIPSTICK. I am that excited to talk about it, even the title is in bold capital letters. I picked this gem up at the local TKMAXX because we don't have a Makeup Forever store/counter where I live. I would have to travel a fair while to get to one. 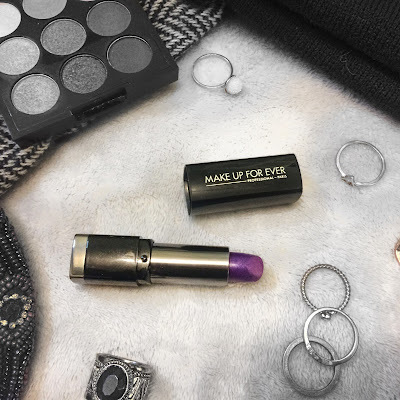 The packaging on this lipstick is so sleek it's perfect to take photo's of, perfect to wear, it's just the right shade for the type of colours I am into wearing at the moment. I am wearing a lot of purple, pink and navy colours. Whether it be from my makeup to hats, coats and jewellery. It's the perfect size to drop in your handbag and carry anywhere with you. It's definitely a must have at the moment for me. See didn't I tell you, it's perfect to take photos of? How stunning is this picture? I am doing a blog post soon on how I edit my photos for blog posts and Instagram. So I shall let you know when that's ready to go live. The pigment on this is well and truly stunning, I honestly when I first saw the colour. I thought 'Ooo this isn't going to be that vibrant! Surely not? ' Boy was I wrong.. Its brighter than what I thought. Its such a creamy texture too so its not harsh when you apply it to the lips. I use a brush to apply it to my lip, only because there have been some occasions where I have worn this as eyeliner. Yes that works too, its not just lipstick, Ill have you know. You can tell by the photo that the colour/pigment is vibrant, it can be easily applied, not harsh on skin, doesn't wear off straight away, like some lipsticks.If you want a perfect lipstick, then look no further than MAKEUP FOREVER. I am definitely going to find out where the closest store/counter is too me or Ill just simply order offline but I want/need more of these in lots of different colours for my makeup collection. I hope you have liked reading my views on the MAKEUP FOREVER LIPSTICK. If you have you should definitely leave a comment below. Also head to my other social media sites and hit subscribe or follow now. I'll be back soon with another glorious post.